This article is about Portland (disambiguation). For other uses, see Portland, Oregon (disambiguation). Nickname(s): "Rose City"; "Stumptown"; "PDX"; see Nicknames of Portland, Oregon for a complete list. Portland (/ˈpɔːrtlənd/) is a port and the largest city in the U.S. state of Oregon and the seat of Multnomah County. It is in the Willamette Valley region of the Pacific Northwest, at the confluence of the Willamette and Columbia Rivers. The city covers 145 square miles (380 square kilometers) and had an estimated population of 632,309 in 2015, making it the 26th most populous city in the United States. Approximately 2,389,228 people live in the Portland metropolitan statistical area (MSA), the 23rd most populous MSA in the United States. Its Combined Statistical Area (CSA) ranks 17th with a population of 3,022,178. Roughly 60% of Oregon's population resides within the Portland metropolitan area. Named after Portland, Maine, the Oregon settlement began to be populated in the 1830s near the end of the Oregon Trail. Its water access provided convenient transportation of goods, and the timber industry was a major force in the city's early economy. At the turn of the 20th century, the city had a reputation as one of the most dangerous port cities in the world, a hub for organized crime and racketeering. After the city's economy experienced an industrial boom during World War II, its hard-edged reputation began to dissipate. Beginning in the 1960s, Portland became noted for its growing liberal political values, and the city has earned a reputation as a bastion of counterculture, which proceeded into the 21st century. According to a 2009 Pew Research Center study, Portland ranks as the eighth most popular American city, based on where people want to live. During the prehistoric period, the land that would become Portland was flooded after the collapse of glacial dams from Lake Missoula, located in what would later become Montana. These massive floods occurred during the last ice age and filled the Willamette Valley with 300 to 400 feet (91 to 122 m) of water. Before American pioneers began arriving in the 1800s, the land that eventually became Portland and surrounding Multnomah County was inhabited for many centuries by two bands of indigenous Chinook people— the Multnomah and the Clackamas peoples. The Chinook people occupying the land which would become Portland were first documented by Meriwether Lewis and William Clark in 1805. Before its European settlement, the Portland Basin of the lower Columbia River and Willamette River valleys had been one of the most densely populated regions on the Pacific Coast. Error creating thumbnail: An unknown error occurred. Large numbers of pioneer settlers began arriving in the Willamette Valley in the 1830s via the Oregon Trail, though life was originally centered in nearby Oregon City. In the early 1840s a new settlement began emerging ten miles from the mouth of the Willamette River, roughly halfway between Oregon City and Fort Vancouver. This community was initially referred to as "Stumptown" and "The Clearing" because of the many trees cut down to allow for its growth. In 1843 William Overton saw potential in the new settlement but lacked the funds to file an official land claim. For 25 cents Overton agreed to share half of the 640-acre (2.6 km2) site with Asa Lovejoy of Boston, Massachusetts. In 1845 Overton sold his remaining half of the claim to Francis W. Pettygrove of Portland, Maine. Both Pettygrove and Lovejoy wished to rename "The Clearing" after their respective hometowns (Lovejoy's being Boston, and Pettygrove's, Portland). This controversy was settled with a coin toss which Pettygrove won in a series of two out of three tosses, thereby providing Portland with its namesake. The coin used for this decision, now known as the Portland Penny, is on display in the headquarters of the Oregon Historical Society. At the time of its incorporation on February 8, 1851, Portland had over 800 inhabitants, a steam sawmill, a log cabin hotel, and a newspaper, the Weekly Oregonian. A major fire swept through downtown in August 1873, destroying twenty blocks on the west side of the Willamette along Yamhill and Morrison Streets, and causing $1.3 million in damage. By 1879, the population had grown to 17,500 and by 1890 it had grown to 46,385. In 1888, the city constructed the first steel bridge built on the West Coast. Portland's access to the Pacific Ocean via the Willamette and the Columbia rivers, as well as its easy access to the agricultural Tualatin Valley via the "Great Plank Road" (the route of current-day U.S. Route 26), provided the pioneer city with an advantage over other nearby ports, and it grew very quickly. Portland remained the major port in the Pacific Northwest for much of the 19th century, until the 1890s, when Seattle's deepwater harbor was connected to the rest of the mainland by rail, affording an inland route without the treacherous navigation of the Columbia River. The lumber industry also became a prominent economical presence, due to the area's large population of Douglas Firs, Western Hemlocks, Red Cedars, and Big Leaf Maple trees. Portland developed a reputation early on in its history as a hard-edged and gritty port town. Some historians have described the city's early establishment as being a "scion of New England; an ends-of-the-earth home for the exiled spawn of the eastern established elite." In 1889, The Oregonian called Portland "the most filthy city in the Northern States," due to the unsanitary sewers and gutters, and, at the turn of the 20th century, it was considered one of the most dangerous port cities in the world. The city housed a large number of saloons, gambling dens, and boardinghouses which were populated with miners after the California Gold Rush, as well as the multitude of sailors passing through the port. 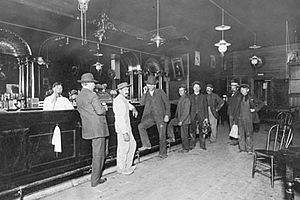 By the early 20th century, the city had lost its reputation as a "sober frontier city" and garnered a reputation for being violent and dangerous. Between 1900 and 1930, the population of the city tripled from nearly 100,000 to 301,815. During World War II, it housed an "assembly center" from which up to 3,676 people of Japanese descent were dispatched on concentration camps in the heartland. The Pacific International Livestock Exposition operated from May through September 10, 1942 processing people from the city, northern Oregon, and central Washington. At the same time, Portland became a notorious hub for underground criminal activity and organized crime between the 1940s and 1950s. In 1957, LIFE Magazine published an article detailing the city's history of government corruption and crime, specifically its gambling rackets and illegal nightclubs. The article, which focused on crime boss Jim Elkins, became the basis of a fictionalized film titled Portland Exposé (1957). 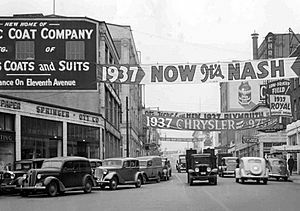 In spite of the city's seedier undercurrent of criminal activity, Portland was experiencing an economic and industrial surge during World War II. Ship builder Henry J. Kaiser had been awarded contracts to construct Liberty ships and aircraft carrier escorts, and chose sites in Portland and Vancouver, Washington for work yards. During this time, Portland's population rose by over 150,000, largely attributed to recruited laborers. In the 1990s, the technology industry began to emerge in Portland, specifically with the establishment of companies like Intel, which brought more than $10 billion in investments in 1995 alone. After the year 2000, Portland experienced significant growth, with a population rise of over 90,000 between the years 2000 and 2014. The city's increased presence within the cultural lexicon has established it a popular city for young people, and it was second only to Louisville, Kentucky as one of the cities to attract and retain the highest number of college-educated people in the United States. Between 2001 and 2012, Portland's gross domestic product per person grew fifty percent, more than any other city in the country. The city has acquired a diverse range of nicknames throughout its history, though it is most frequently called "Rose City" or "The City of Roses", the latter of which being its unofficial nickname since 1888 and its official nickname since 2003. Another widely utilized nickname by local residents in everyday speech is "PDX", which is also the airport code for Portland International Airport. Other nicknames include Bridgetown, Stumptown, Rip City, Soccer City, P-Town, Portlandia, and the more antiquated Little Beirut. Mt. Rainier (left) and Mt. 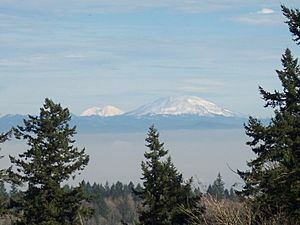 St. Helens (right) photographed from Mount Calvary Cemetery in Portland. Portland is located 60 miles east of the Pacific Ocean at the northern end of Oregon's most populated region, the Willamette Valley. Downtown Portland straddles the banks of the Willamette River, which flows north through the city center and consequently separates the east and west neighborhoods of the city. Less than 10 miles from downtown, the Willamette River flows into the Columbia River, the fourth-largest river in the United States, which divides Oregon from Washington state. Portland is about 100 miles upriver from the Pacific Ocean on the Columbia. Though much of downtown Portland is relatively flat, the foothills of the Tualatin Mountains, more commonly referred to locally as the "West Hills", pierce through the northwest and southwest reaches of the city. Council Crest Park, the tallest point within city limits, is located in the West Hills and rises to an elevation of 1,073 feet. The highest point east of the river is Mt. Tabor, an extinct volcanic cinder cone, which rises to 636 feet. Nearby Powell Butte and Rocky Butte rise to 614 feet and 612 feet, respectively. To the west of the Tualatin Mountains lies the Oregon Coast Range, and to the east lies the actively volcanic Cascade Range. On clear days, Mt. Hood and Mt St. Helens dominate the horizon, while Mt. Adams and Mt. Rainier can also be visible in the distance. According to the United States Census Bureau, the city has a total area of 145.09 square miles (375.78 km2), of which 133.43 square miles (345.58 km2) is land and 11.66 square miles (30.20 km2) is water. Although almost all of Portland lies within Multnomah County, small portions of the city lie within Clackamas and Washington Counties, with populations estimated at 785 and 1,455, respectively. Portland lies on top of an extinct volcanic field known as the Boring Lava Field. The Boring Lava Field contains at least 32 cinder cones such as Mount Tabor, and its center lies in southeast Portland. Mount St. Helens, a highly active volcano 50 miles northeast of the city in Washington State, is easily visible on clear days and is close enough to have dusted the city with volcanic ash after its eruption on May 18, 1980. 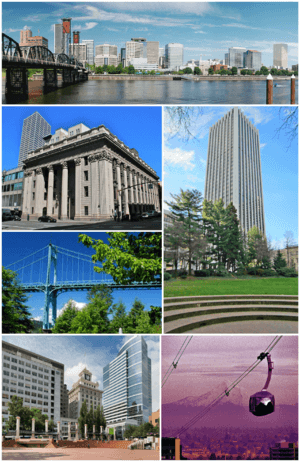 Portland's cityscape derives much of its character from the numerous bridges that span the Willamette River downtown, several of which are historic landmarks, and Portland has been nicknamed "Bridgetown" for many decades as a result. Three of downtown's most heavily utilized bridges are more than 100 years old and are designated historic landmarks: Hawthorne Bridge (1910), Steel Bridge (1912), and Broadway Bridge (1913). Portland's newest bridge in the downtown area, Tilikum Crossing, opened in 2015 and is the first new bridge to span the Willamette in Portland since the 1973 opening of the double-decker Fremont Bridge. The five quadrants of Portland have come to develop distinctive identities over time, with mild cultural differences and friendly rivalries between their residents, especially between those who live east of the Willamette River versus west of the river. 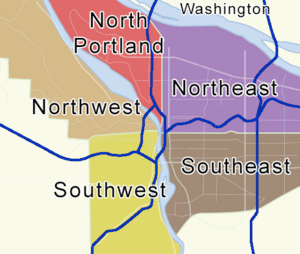 The official quadrants of Portland are: North, Northwest, Northeast, Southwest, and Southeast, with downtown Portland being located in the SW quadrant. The Willamette River divides the east and west quadrants while Burnside Street, which traverses the entire city lengthwise, divides the north and south quadrants. All addresses within the city are denoted as belonging to one of these specific quadrants with the prefixes: N, NW, NE, SW or SE. Though officially located in SW Portland, the RiverPlace, John's Landing and South Waterfront neighborhoods lie in a so-called (but unofficial) "sixth quadrant" called South Portland, where addresses rise higher from west to east toward the river. This "sixth quadrant" is roughly bounded by Naito Parkway and Barbur Boulevard to the west, Montgomery Street to the north and Nevada Street to the south. East-West addresses in this area are denoted with a leading zero (instead of a minus sign). This means 0246 SW California St. is not the same as 246 SW California St. Many mapping programs are unable to distinguish between the two. Old Town Chinatown is located adjacent to the Pearl District in Northwest Portland, while Southwest Portland consists largely of the downtown district, made up of commercial businesses, museums, skyscrapers, and public landmarks. 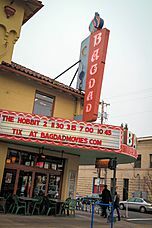 Southeast Portland is largely residential, and consists of the Hawthorne District, Belmont, Brooklyn, and Mount Tabor. 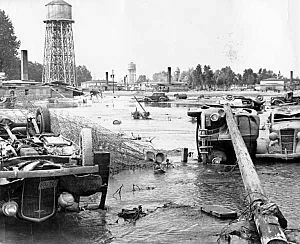 In 1948 the city of Vanport was flooded and several buildings constructed a few years prior were a total loss, including Vanport Extension Center. Portland experiences a temperate climate with both oceanic and Mediterranean features. This climate is characterized by warm, dry summers and cool, rainy winters. The precipitation pattern is distinctly Mediterranean, with little to no rainfall occurring during the summer months and more than half of annual precipitation falling between November and February. Portland experiences a much cooler climate than areas of similar latitude on the west coast of Europe. Of the three most populated cities within the Pacific Northwest (Seattle, Vancouver and Portland, respectively) Portland has the warmest average temperature, the highest number of sunshine hours, and the fewest inches of rainfall and snowfall. According to the Köppen climate classification, Portland falls within the dry-summer mild temperate zone (Csb), also referred to as a warm-summer Mediterranean climate with a USDA Plant Hardiness Zones between 8b and 9a. Other climate systems, such as the Trewartha climate classification, places it within the oceanic zone (Do), like much of the Pacific Northwest and Western Europe. Summers in Portland are warm to hot, dry, and sunny. The months of June, July, August and September account for a combined 4.49 inches (114 mm) of total rainfall – only 12% of the 36.03 in (915 mm) of the precipitation that falls throughout the year. The warmest month is August, with an average high temperature of 81.1 °F (27.3 °C). Because of its inland location 70 miles (110 km) from the coast, as well as the protective nature of the Oregon Coast Range to its west, Portland summers are less susceptible to the moderating influence of the nearby Pacific Ocean. Consequently, Portland experiences heat waves with temperatures rising well above 90 °F (32 °C) for days at a time, and sometimes above 100 °F (38 °C). On average, temperatures reach or exceed 80 °F (27 °C) 56 days per year, of which 12 days will reach 90 °F (32 °C) and 1.4 days will reach 100 °F (38 °C). The most 90 degree days ever recorded in one year is 29, which happened in 2015. The highest temperature ever recorded was 107 °F (42 °C), on July 30, 1965, as well as August 8 and 10, 1981. The warmest recorded overnight low was 74 °F (23 °C) on July 28, 2009. A temperature of 100 °F (38 °C) has been recorded in all five months from May through September. Spring and fall can bring variable weather including warm fronts that send temperatures surging above 80 °F (27 °C) and cold snaps that plunge daytime temperatures into the 40s °F (4–9 °C). However, consistently mild temperatures in the 50s and 60s °F (12–19 °C) are the norm – with lengthy stretches of cloudy or partly cloudy days beginning in mid fall and continuing into mid spring. Rain often falls as a light drizzle for several consecutive days at a time, contributing to 155 days on average with measurable (≥0.01 in or 0.25 mm) precipitation annually. Temperatures have reached 90 °F (32 °C) as early as May 3 and as late as October 5, while 80 °F (27 °C) has been reached as early as April 1 and as late as October 21. Severe weather, such as thunder and lightning, is uncommon and tornadoes are exceptionally rare. 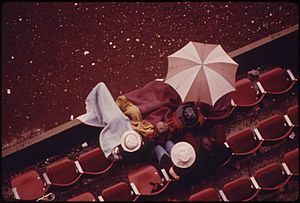 Spectators at Civic Stadium (now Providence Park Field) during a football game. Winters are cool, cloudy, and rainy. The coldest month is December with an average daily high of 45.6 °F (7.6 °C), although overnight lows usually remain above freezing. Evening temperatures fall to or below freezing 33 nights per year on average, but very rarely to or below 20 °F (−7 °C). There are only 2.1 days per year where the daytime high temperature fails to rise above freezing. The lowest overnight temperature ever recorded was −3 °F (−19 °C), on February 2, 1950 while the coldest daytime high temperature ever recorded was 14 °F (−10 °C) on December 30, 1968. The average window for freezing temperatures to potentially occur is between November 15 and March 19, allowing a growing season of 240 days. Snowfall is uncommon with a normal yearly accumulation of 4.3 inches (10.9 cm), which usually falls during only two or three days per year. Portland has one of the warmest and least snowy winters of any non-Sun Belt city in the United States, with more than 25 percent of its winters receiving no snow whatsoever. The city of Portland avoids snow more frequently than its suburbs, due in part to its low elevation and urban heat island effect. Neighborhoods outside of the downtown core, especially in slightly higher elevations near the West Hills and Mount Tabor, can experience a dusting of snow while downtown receives no accumulation at all. 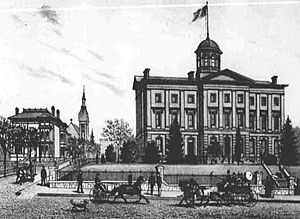 The city has experienced a few major snow and ice storms in its past with extreme totals having reached 44.5 in (113 cm) at the airport in 1949–50 and 60.9 in (155 cm) at downtown in 1892–93. The census reported the city as 76.1% White (444,254 people), 7.1% Asian (41,448), 6.3% Black or African American (36,778), 1.0% Native American (5,838), 0.5% Pacific Islander (2,919), 4.7% belonging to two or more racial groups (24,437) and 5.0% from other races (28,987). 9.4% were Hispanic or Latino, of any race (54,840). Whites not of Hispanic origin made up 72.2% of the total population. Portland residents identifying solely as Asian Americans account for 7.1% of the population; an additional 1.8% is partially of Asian heritage. Vietnamese Americans make up 2.2% of Portland's population, and make up the largest Asian ethnic group in the city, followed by Chinese (1.7%), Filipinos (0.6%), Japanese (0.5%), Koreans (0.4%), Laotians (0.4%), Hmong (0.2%), and Cambodians (0.1%). There is a small population of Yao people that live in Portland. Portland has two Chinatowns, with New Chinatown located along SE 82nd Avenue with Chinese supermarkets, Hong Kong style noodle houses, dim sum, and Vietnamese phở restaurants. Portland's population has been and remains predominantly white. In 1940, whites were over 98% of the city's population. In 2009, Portland had the fifth-highest percentage of white residents among the 40 largest U.S. metropolitan areas. A 2007 survey of the 40 largest cities in the U.S. concluded that Portland's urban core has the highest percentage of white residents. Some scholars have noted the Pacific Northwest as a whole is "one of the last Caucasian bastions of the United States". While Portland's diversity was historically comparable to metro Seattle and Salt Lake City, those areas grew more diverse in the late 1990s and 2000s. Portland not only remains white, but migration to Portland is disproportionately white. During redevelopment of north Portland along the MAX Yellow Line, displacement of minorities occurred at a drastic rate. Out of 29 census tracts in north and northeast Portland, ten were majority nonwhite in 2000. By 2010, none of these tracts were majority nonwhite as gentrification drove the cost of living up. Today, Portland's African-American community is concentrated in the north and northeast section of the city, mainly in the King neighborhood. Out of 223,737 households, 24.5% have children under the age of 18 living with them, 38.1% are married couples living together, 10.8% have a female householder with no husband present, and 47.1% are non-families. 34.6% of all households are made up of individuals and 9% have someone living alone who is 65 years of age or older. The average household size is 2.3 and the average family size is 3. The age distribution was 21.1% under the age of 18, 10.3% from 18 to 24, 34.7% from 25 to 44, 22.4% from 45 to 64, and 11.6% who are 65 years of age or older. The median age is 35 years. For every 100 females there are 97.8 males. For every 100 females age 18 and over, there are 95.9 males. The Portland metropolitan area has historically had a significant LGBT population throughout the late 20th and 21st century. In 2015, the city metro had the second highest percentage of LGBT residents in the United States with 5.4% of residents identifying as gay, lesbian, bisexual, or transgender, second only to San Francisco. In 2006, it was reported to have the seventh highest LGBT population in the country, with 8.8% of residents identifying as gay, lesbian, or bisexual, and the metro ranking fourth in the nation at 6.1%. The city held its first pride festival in 1975 on the Portland State University campus. Portland is known for its population of hipsters. Portland has been cited as the least religious city in the United States, with over 42% of residents identifying as religiously "unaffiliated," according to the nonpartisan and nonprofit Public Religion Research Institute's American Values Atlas. Of the 35.89% of the city's residents who do identify as religious, Roman Catholics make up the largest group, at 15.8%. The second highest religious group in the city are Evangelical Christians at 6.04%, with Baptists following behind at 2.5%. Latter Day Saints make up 2.3% of the city's religiously affiliated population, with Lutheran and Pentecostal following behind. 1.48% of religiously affiliated persons identified themselves as following Eastern religions, while 0.86% of the religiously affiliated population identified as Jewish, and 0.29% as Muslim. Portland is home to famous bands such as the Kingsmen and Paul Revere & the Raiders, both famous for their association with the song "Louie Louie" (1963). Other widely known musical groups include the Dandy Warhols, Quarterflash, Everclear, Pink Martini, The Hugs, Sleater-Kinney, the Shins, Blitzen Trapper, the Decemberists, and the late Elliott Smith. In the 1980s, the city was home to a burgeoning punk scene, which included bands such as the Wipers and Dead Moon. The city's now-demolished Satyricon nightclub was a punk venue that is notorious for being the place where Nirvana frontman Kurt Cobain first encountered future wife and Hole frontwoman Courtney Love in 1990. 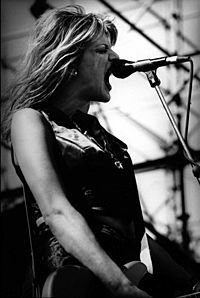 Love was then a resident of Portland and started several bands there with Kat Bjelland, later of Babes in Toyland. 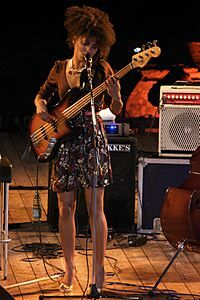 Multi-Grammy award-winning jazz artist Esperanza Spalding is from Portland and performed with the Chamber Music Society of Oregon at a young age. In 2013, the Guardian named the city's music scene as one of the "most vibrant" in the United States. 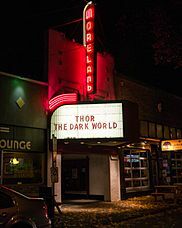 According to the New York Times, the dozens of karaoke bars in Portland make it not just "the capital of karaoke" in the United States but also "one of the most exciting music scenes in America. 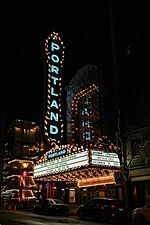 Portland also has a range of classical performing arts institutions, which include the Oregon Symphony, Portland Opera, and the Portland Youth Philharmonic. The city is also home to several theaters and performing arts institutions, including the Oregon Ballet Theatre, Northwest Children's Theatre, Portland Center Stage, Artists Repertory Theatre, Miracle Theatre, and Tears of Joy Theatre. A wide range of films have been shot in Portland, from various independent features to major big-budget productions (see List of films shot in Oregon for a complete list). Director Gus Van Sant has notably set and shot many of his films in the city. The IFC sketch comedy series Portlandia, starring Fred Armisen and Sleater-Kinney member Carrie Brownstein, shoots on location in Portland, satirizing the city as a hub of liberal politics, organic food, alternative lifestyles, and anti-establishment attitudes. MTV's long-time running reality show The Real World was shot in Portland for the show's 29th season. The Real World: Portland premiered on MTV on March 27, 2013, and was filmed in a loft in the Pearl District. The show featured the cast members taking part in several Portland activities, such as hiking in the Columbia River Gorge. The cast members worked at a local frozen yogurt shop and the local Pizza Schmizza. Other TV shows shot in the city include Leverage, The Librarians, Under Suspicion, Grimm, Nowhere Man, and Life Unexpected. 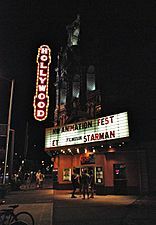 The Hollywood Theatre currently exists as a non-profit organization. 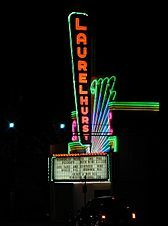 The Art Deco designed Laurelhurst Theater in the Kerns neighborhood was opened in 1923. Portland museums offer a variety of educational programs. The Oregon Museum of Science and Industry (OMSI) includes many hands-on activities for adults and children. It consists of five main halls, most of which consist of smaller laboratories: Earth Science Hall, Life Science Hall, Turbine Hall, Science Playground, and Featured Exhibit Hall. The Featured Exhibit Hall has a new exhibit every few months. The laboratories are Chemistry, Physics, Technology, Life, Paleontology, and Watershed. OMSI has many other unique attractions, such as the USS Blueback submarine used in the film The Hunt for Red October, the OMNIMAX Dome Theater, and OMSI's Kendall Planetarium. The OMNIMAX Dome Theater is a variant of the IMAX motion picture format, where the movie is projected onto a domed projection surface. The projection surface at OMSI's OMNIMAX Dome Theater is 6,532 sq ft (606.8 m2). The OMNIMAX Theater uses the largest frame in the motion picture industry, and the frames are ten times the size of the standard 35mm film. OMSI's Kendall Planetarium is the largest and most technologically advanced planetarium in the Pacific Northwest. OMSI is built right up next to the river and is also conveniently located near the entrance to the Springwater Corridor and Eastbank Esplanade pedestrian and bike trails. The Portland Art Museum owns the city's largest art collection and presents a variety of touring exhibitions each year, and with the recent addition of the Modern and Contemporary Art wing, it became one of the United States' 25 largest museums. The Oregon History Museum was founded in 1898. The Oregon History Museum has a variety of books, film, pictures, artifacts, and maps dating back throughout Oregon's history. The Oregon History Museum has one of the most extensive collections of state history materials in the United States. The Portland Children's Museum is a museum specifically geared for early childhood development. This museum has many topics, and many of their exhibits rotate, to keep the information fresh. The Portland Children's Museum also supports a small charter school for elementary children. Portland has been named the best city in the world for street food by several publications, including the U.S. News & World Report and CNN. Food carts are extremely popular within the city, with over 600 licensed carts, making Portland one of the most robust street food scenes in North America. Portland has the most total breweries and independent microbreweries of any city in the world, with 58 active breweries within city limits and 70+ within the surrounding metro area. The city receives frequent acclaim as the best beer city in the United States and is consistently ranked as one of the top-five beer destinations in the world. Portland has played a prominent role in the microbrewery revolution in the U.S. and is nicknamed "Beertown" and "Beervana" as a result. Portland's modern microbrewery boom dates to the 1980s, when Oregon state law was changed to allow the consumption of beer on brewery premises. Brewery innovation is further supported by the abundance of beer ingredients produced locally, including two-row barley, over a dozen varieties of local Cascade hops, and pure mountain water from the Bull Run Watershed. The beer culture is partially responsible for CNBC naming Portland the best city for happy hour in the U.S. The McMenamin brothers alone have over thirty brewpubs, distilleries, and wineries scattered throughout the metropolitan area, several in renovated cinemas and other historically significant buildings otherwise destined for demolition. Other notable Portland brewers include Widmer Brothers, BridgePort, Portland Brewing, Hair of the Dog, and Hopworks Urban Brewery. In 1999, author Michael "Beerhunter" Jackson called Portland a candidate for the beer capital of the world because the city boasted more breweries than Cologne, Germany. Portland is also known as a leader in specialty coffee. The city is home to Stumptown Coffee Roasters as well as dozens of other micro-roasteries and cafes. Portland has an emerging restaurant scene nationally and among three nominees, was recognized by the Food Network Awards as their "Delicious Destination of the Year: A rising city with a fast-growing food scene" for 2007. In 2014, the Washington Post called Portland the fourth best city for food in the United States. Travel + Leisure ranked Portland's food and bar scene #5 in the nation in 2012. The city is also known for being among the most vegan-friendly cities in America. Portland is home to a diverse array of artists and arts organizations and was named in 2006 by American Style magazine as the tenth best Big City Arts Destination in the country. Portland's public art is managed by the Regional Arts & Culture Council. Art galleries abound downtown and in the Pearl District, as well as in the Alberta Arts District and other neighborhoods throughout the city. Portlandia, a statue on the west side of the Portland Building, is the second-largest hammered-copper statue in the U.S. (after the Statue of Liberty). Portland's public art is managed by the Regional Arts & Culture Council. Powell's City of Books claims to be the largest independent new and used bookstore in the world, occupying a multistory building on an entire city block in the Pearl District. In 2010, Powell's Technical Books was relocated to Powell's Books Bldg. 2 across the street from the flagship store. In 2012, the city was named by Travel & Leisure magazine as the No. 1 city in the country for book stores. The Portland Rose Festival takes place annually in June and includes two parades, dragon boat races, carnival rides at Tom McCall Waterfront Park, and dozens of other events. The city is home to the Rosebud and Thorn Pageant, started in 1975 and modeled after the Imperial Sovereign Rose Court of Oregon. Washington Park, in the West Hills, is home to some of Portland's most popular recreational sites, including the Oregon Zoo, the World Forestry Center, and the Hoyt Arboretum. Oaks Amusement Park, located in the Sellwood district of Southeast Portland, is the city's only amusement park and is also one of the longest-running amusement parks in the country. It has been in operation since 1905 and was known as the "Coney Island of the Northwest" upon its opening. Portland hosts a number of festivals throughout the year in celebration of beer and brewing, including the Oregon Brewers Festival, held in Tom McCall Waterfront Park. Held each summer during the last full weekend of July, it is the largest outdoor craft beer festival in North America, with over 70,000 attendees in 2008. Other major beer festivals throughout the calendar year include the Spring Beer and Wine Festival in April, the North American Organic Brewers Festival in June, the Portland International Beerfest in July, and the Holiday Ale Festival in December. Pioneer Courthouse Square also holds an annual Christmas tree lighting on the Friday after Thanksgiving, and the tree remains in the square for five to six weeks through the holiday season. 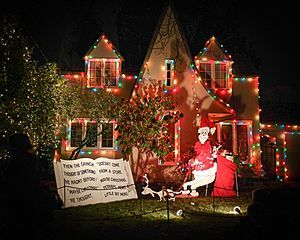 The residents of Peacock Lane, a street in the Sunnyside neighborhood, annually decorate their houses for the Christmas season and provide rides through the neighborhood in horse drawn carriage, a tradition established in the 1920s. Portland is often awarded "Greenest City in America" and "most green cities" designations. Popular Science awarded Portland the title of the Greenest City in America in 2008, and Grist magazine listed it in 2007 as the second greenest city in the world. The city became a pioneer of state-directed metropolitan planning, a program which was instated statewide in 1969 to compact the urban growth boundaries of the city. 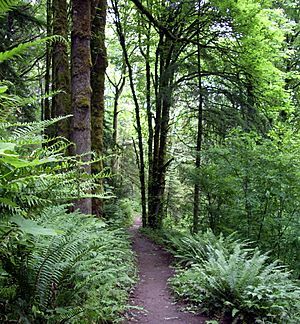 Forest Park is the largest wilderness park within city limits in the United States, covering more than 5,000 acres (2,023 ha). Portland is also home to Mill Ends Park, the world's smallest park (a two-foot-diameter circle, the park's area is only about 0.3 m2). Washington Park is just west of downtown and is home to the Oregon Zoo, the Portland Japanese Garden, and the International Rose Test Garden. Portland is also home to Lan Su Chinese Garden (formerly the Portland Classical Chinese Garden), an authentic representation of a Suzhou-style walled garden. Tryon Creek State Natural Area is one of three Oregon State Parks in Portland and the most popular; its creek has a run of steelhead. The other two State Parks are Willamette Stone State Heritage Site, located in the West Hills, and the Government Island State Recreation Area located in the Columbia River near Portland International Airport. Portland's city park system has been proclaimed one of the best in America. In its 2013 ParkScore ranking, the Trust for Public Land reported that Portland had the seventh best park system among the 50 most populous U.S. cities. ParkScore ranks city park systems by a formula that analyzes the city's median park size, park acres as percent of city area, the percent of city residents within a half-mile of a park, spending of park services per resident, and the number of playgrounds per 10,000 residents. The survey revealed that 80% of Portlanders live within a half-mile to a park, and over 16% of Portland's city area is parkland. Cathedral Park under the St. Johns Bridge hosts an annual jazz music festival. 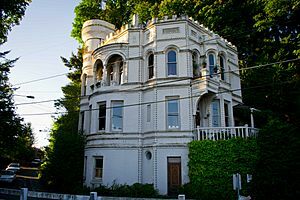 Originally built as the private residence of The Oregonian publisher Henry Pittock, Pittock Mansion now serves as a public park. Sapporo, Japan is Portland's oldest sister city. Legacy Good Samaritan Medical Center, located in the Northwest district. Portland Aerial Tram connects the South Waterfront district with OHSU. Adidas has its North America headquarters in the Overlook neighborhood. 1966 photo shows sawdust-fired power plant on the edge of downtown that was removed to make way for dense residential development. High rises to left in background were early projects of the Portland Development Commission. The 2015-opened Tilikum Crossing attracted national attention for being a major bridge that is open only to transit vehicles, cyclists and pedestrians, and not private motor vehicles. The Oregonian Building of 1892, which no longer stands. KPTV is the current Fox Broadcasting Company affiliate. The Shamrock Run, held annually on St. Patrick's Day. Portland, Oregon Facts for Kids. Kiddle Encyclopedia.